Air plants belong to the genus Tillandsia, which includes roughly 600 species of epiphytes, noted for their wiry, silver-green foliage. Species such as the Mexican air plant (Tillandsia ionantha) are widely grown as houseplants, but they will also survive outdoors within U.S. Department of Agriculture plant hardiness zones 10 and 11. Air plants require minimal hands-on care once established, but most benefit from regular attention throughout the year to keep them looking their best. An air plant growing on a rock. 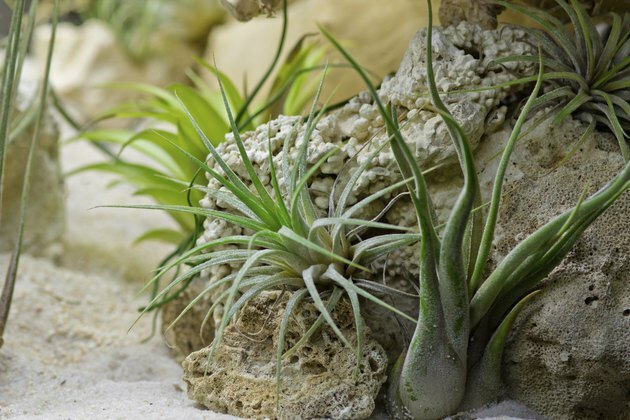 Moisture is arguably the most important aspect of growing air plants. Growing them in a naturally humid location such as a bathroom or kitchen will help alleviate stress associated with dry conditions, but it is not enough. Misting them with water every few days is a good practice, especially if they are exposed to drying winds or heater vents. Air plants also need regular deep watering, especially if they show signs of dehydration such as curling leaves. Submerge the entire plant in room-temperature water for at least 30 minutes every seven to ten days, shake off the excess moisture and return the plant to its original position. Air plants are sensitive to chemicals in tap water, so use bottled, distilled or rainwater whenever possible. Air plants require very little supplemental nutrients to thrive, but most appreciate light monthly feedings to support their growth and blooming. Feeding air plants differs from other houseplants because of their epiphytic nature. Their roots are sensitive and cannot absorb urea like terrestrial plants. Use a urea-free fertilizer with an N-P-K analysis of 30-10-10 or 17-8-22. Mix the fertilizer at one-quarter to one half the recommended strength, dissolving roughly 1/3 to 1/2 teaspoon of fertilizer in 1 gallon of water. Apply the fertilizer by misting it onto the leaves until they are saturated, or replace their weekly soaking water with the fertilizer solution once a month. Withhold fertilizer entirely in winter. Air plants seldom need pruning to control their size or improve their shape thanks to their naturally dense, tidy growth habit. They may need occasional grooming, however, to restore their appearance. Air plants produce showy, long-lasting flowers that detract from their appearance once they begin fade. Remove them when their reddish bracts begin to brown, snipping them off at the base. Use sharp pruning shears that have been soaked for five minutes in a sanitizing solution of half rubbing alcohol and half water. When pruning, avoid nicking or damaging the surrounding foliage because it might kill it. Established air plants experience very few serious problems. Insects and other pests do not bother them, nor do they suffer from any chronic diseases. The only serious issue facing air plants is cultural. Potting in soil drastically increases the likelihood of serious root problems. For an air plant to be healthy, its roots need access to freely circulating air. Grow air plants mounted on wood or other organic materials, and display them up high where light and air can reach them. Avoid growing them in vessels that collect significant amounts of standing water because it may encourage leaf and root problems. Also, avoid chemically treated wood and petroleum-base glues that might harm the air plant's sensitive tissues.